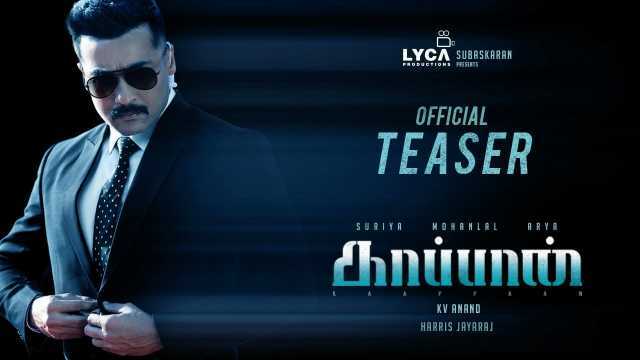 The highly anticipated teaser of Suriya’s Kaappaan (2019), which also stars Malayalam superstar Mohanlal in a crucial role, was unveiled on the occasion of Tamil New Year on Sunday. If the minute-and-a-half teaser is anything to go by, audiences are in for an action-packed ride filled with intrigue. Rumoured to be playing a bodyguard or special agent, the teaser introduces Suriya sporting different disguises from a bomber, a naive villager, a handicapped Muslim man and a government official. We see him deal with explosives like it's child’s play. The film is really high on action. In one scene, we see Suriya run atop a moving train. We also see Sayyeshaa Saigal, who plays the leading lady, on Suriya’s pursuit and she calls him a terrorist. Boman Irani also makes an appearance in the teaser. Directed by KV Anand, Kaappaan marks the first time on screen collaboration of Suriya and Mohanlal. In a recent Facebook live chat, Suriya opened up about working with Mohanlal in the film. Suriya said he takes reference for his films from Mohanlal's work. While most actors struggle to perform in front of a camera, Suriya said that even if there is a magnifying lens right in front of his face, Mohanlal will make it disappear.